Are you ready for a custom home building project? : iBuildNew Blog Are you ready for a custom home building project? Are you thinking of embarking on a custom home building project? Throughout the process of a house building project there are many advantages of using a custom builder. Before committing to a custom home building project there are many things you may wish to consider. Things can get tricky when building a custom home, and one of the main advantages of building with a custom builder is the amount of support you will receive from professionals along the way. Contrary to popular belief, volume builders do allow for customisation. They often offer a wide range of inclusions and upgrades so you can fix your home to your needs and budget. Ultimately, however, the more modifications you add on, the more your custom home building project could cost. This is different when acquiring a custom builder. If your project requires a unique, personalised touch with higher levels of customisation, a custom builder will be an apt choice. It is important to make this consideration well before you make any commitments toward one or the other. Whether you already own the land or are contemplating a knockdown/rebuild, consider the land’s dimensions and location. Both factors may influence what type of builder you should be working with. 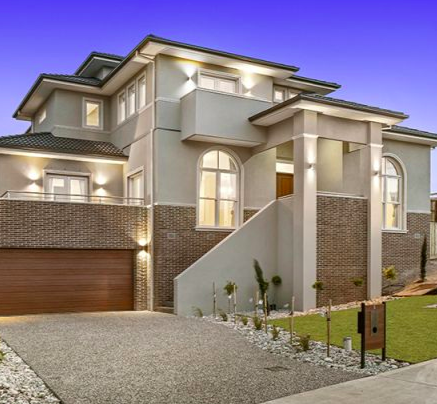 It is also important to consider that a volume builder’s home designs won’t take into consideration your block’s orientation to natural light, nor bushfire regulations in particular areas. Custom builders will take these factors into account and build accordingly. Put simply, project homes can be cheaper, and are generally less risky if you are uncertain and working cautiously toward a strict budget. Custom homes, on the other hand, can be tailored exactly how you would like them, right down to the minor detail. You will need to weigh up whether the extra costs equal the value of customisation. There is a certain unknown that comes associated with building your custom home. In the case of project builders, they typically have 50-100 pre-set home designs to pick from. The majority of these volume builders have a diverse selection of display homes which are on display for you to check out. The advantage in this is that you walk through a display and get a genuine feel of what your home may end up like. Things like space, how the house flows, if everything is how you pictured it well before you make your final commitment. With custom builders, you will only be able to view previous work they have completed to get a sense of how they work, and their capabilities. You won’t be able to experience the design itself, apart from going over floor and layout plans. For more information regarding financial options when building, or investing in a house and land package, or other investment opportunities, be sure you speak to one of our home building experts on 1800 184 284.